Mott's Sam Burton looks upcourt against Lansing. LANSING, Michigan — Steve Schmidt couldn’t lose this one. 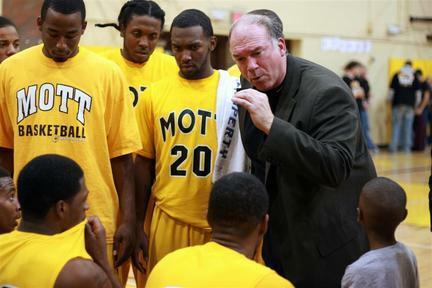 Mott’s longtime head coach was raised in Lansing, played high school basketball at Waverly High School and even helped coach Lansing Community College to the NJCAA national championship in 1988. The ’88 LCC squad was honored at halftime in front of a larger-than-normal Homecoming crowd that couldn’t help but remember the good old days. Schmidt’s Bears dismantled the Stars in the first half on the strength of sophomore sharpshooter Bobby Lewis‘ six 3-pointers and cruised to a 67-43 victory. Just another night at the office for Doug Anderson: 14 points, seven dunks. FLINT, Michigan — The Mott Community College Bears rode a ridiculous 32-2 run in the first half to outlast Sinclair (Ohio) on Saturday night in Flint, 78-64. The Bears uber-athletic pair of forwards, 6-6 Doug Anderson and 6-7 Torian Oglesby, had 11 dunks between them. 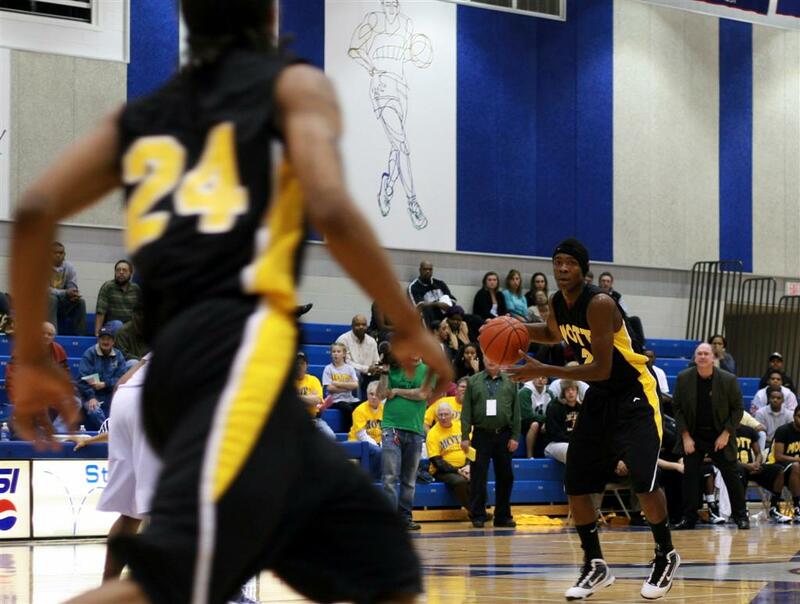 Oglesby had 16 points with eight rebounds, five steals and four assists to lead the Bears. Anderson had 14 points on seven dunks. Freshman point guard Demetrius Miller, a 2009 graduate of Flint Central, was a major bright spot for the Bears in the backcourt Saturday night. Miller looked very comfortable leading the team when starting point guard Sam Burton was on the bench with foul trouble.